Chelsea are ready to cash-in on Willian if £65m is put on the table as Manchester United prepare a formal bid for the attacker this summer, according to reports via TeamTalk. Willian has been an excellent signing for Chelsea since arriving from Anzhi Makhachkala in 2013 as he’s provided 44 goals and 39 assists in his 236 appearances to help the Blues win 2 Premier League titles and 3 domestic cups. However, the Brazilian international found life difficult under Antonio Conte last season as he started just 20 games and admitted at the end of last season that he was frustrated to be left on the bench at Stamford Bridge. Willian still managed to provide 13 goals and 12 assists to land the Chelsea Players’s Player of the Tear award but with the attacker turning 30 in August, TeamTalk claim that Chelsea are prepared to cash-in if a suitable offer arrives with the west Londoners wanting around £65m. The situation has alerted Barcelona with reports suggesting the La Liga champions have already seen a £50m bid rejected but TeamTalk are citing a report from the Express that claims Man Utd are now ready to make a big offer of their own. 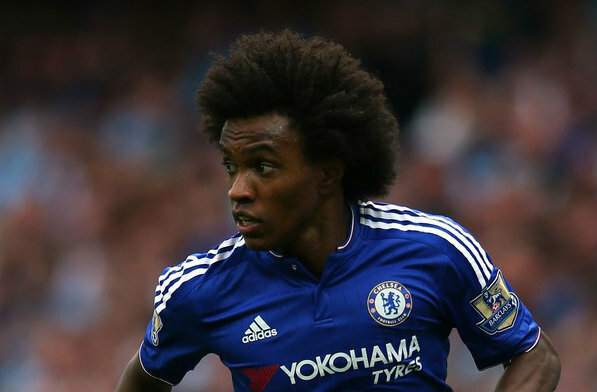 The Red Devils have been linked with Willian ever since Jose Mourinho took over two years ago as the Portuguese coach is a known fan having been the man to sign the South American attacker during his time at Chelsea. Mourinho is looking to further strengthen his squad as he tries to build a side capable of competing with Manchester City next season and he’s already snapped up right-back Diogo Dalot from Porto and midfielder Fred from Shakhtar Donetsk. However, it seems Mourinho is also keen to add to his attacking options and he could be eyeing a reunion with Willian at Old Trafford amid speculation linking Anthony Martial with a move this summer. Chelsea have shown in the past with the sales of Juan Mata and Nemanja Matic that they’ll do business with United if the price is right so Willian could become the latest player to swap west London for Manchester. We need him at manchester united but will chelsea allow him to go? What is wrong with Morinho? Man utd problem is not players but his system (pattern) of play. Man utd have more quality players in Linguad, Martial, Lukaku, Sanchez, Pogba, Hererra, Mata than Man city. But Morinho is outdated parking bus, playing sidewest & long balls. Todays football is all about tip-tap, jogobonitor etc. He has not trust or given chance to young players like Shaw, Damian who are natural left & right back, who if trusted will attack like Macello & Carvejal. He need to build Man Utd on young players as Sir Alex did, but trusting or buying players in their 30s is a waste coz we’ve seen it last season when they can’t capp with teams like Man City, Lkiverpool coz of their tired legs. Klopp & Guidiola have succesded by introducing attacking football with players not up to Man utd quality. I suggest Morinho should go back to his drawing board, give his players chance even if they make mistakes correct & encourage them. In a nutshell, Man utd need to build on young talent even if it will take two or more years, but for the coach to defend on his old tired legs players after squandering millions & nothing (trophyless) is a shame.